A snow gauge is an instrument used by the meteorology department to gather and measure the amount of solid precipitation (as opposed to liquid precipitation that is measured by a rain gauge) over a period of time. Meteorology department measures how much snow falls into the gauge. General method used to measure snowfall is to melt the collected snow in a still container which is then poured into a glass measuring beaker. While snow is normally measured in centimeters, melted snow is measured in millimeters. It is also used to estimate the snow depth which is obtained by multiplying the water equivalent by ten. Changing climatic conditions and higher snowfall in recent times are expected to be the key growth drivers for the snow gauge during the period of study. Geographically, North America dominated the snow gauge market driven by higher demand and consumption of snow gauges due to higher snowfall and climatic conditions. North America was followed by Europe and Asia-Pacific as second and third largest market for snow gauge market. This report identifies the snow gauge market size for the years 2014-2016, and forecast of the same till the year 2022. 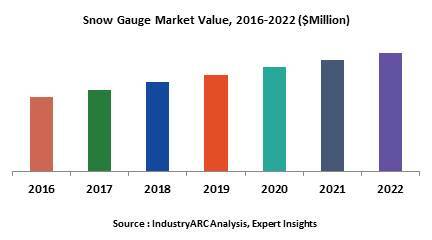 It also highlights the market drivers, restraints, growth indicators, challenges, and other key aspects with respect to the snow gauge market. Snow gauge market research report is classified on the basis of types. Some of the major types covered in this report are as follows: Mechanical Type Snow gauge, Digital Snow Gauge, Snow Pillow. Snow gauge market research report is classified on the basis of end-user. Some of the major end-users covered in this report are as follows: Meteorology department, Educational & R&D institutes, Others.